My good friend Tim Reed asked for my thoughts on his latest book, Spider from the Well, and I was happy to oblige! Tim is a young author of fantasy novels and short stories. You can get most of his content on Amazon. 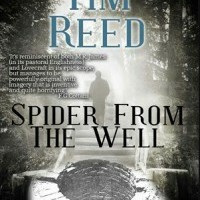 Spider from the well is a short horror story by Tim Reed about the titular spider hiding in the well. Out for a pleasant walk in the English countryside, a young couple chances upon a rotting, faded journal. On a lark, they begin reading – only to discover the last words of a landowner, dead for decades, and his story of dimensional horrors lurking in his well and beyond! This book certainly wouldn’t feel out of place in an H.P. Lovecraft collection, and shares that authors’ preference for claustrophobic environments and laborious descriptions. At times, these veered into being a bit long-winded for a modern short story, but given the obvious inspiration behind the story this isn’t a great surprise. Another mainstay of Tim’s writing I’ve noticed is his love of abstract imagery. Alien visions and maddening sights are almost a common sight in the TimReediverse! Compared to his other works, I was pleased to find the descriptions here a lot more grounded and less lost in metaphor, while still conveying that sense of the strange and unreal. If you’re looking for a taste of cthulhoid victorian horror to spice up your sweltering summer evenings, Spider from the Well should be plenty to sate your appetite!